The Conceptual Framework Elements are used to model the architectural descriptions and to establish concepts for architectural thinking. The Toolbox element design is based on IEEE standard 1471 - 2000. Captures the mission statement, policies and values of the enterprise. Defines the developmental, operational and programmatic context of the system for the purpose of Enterprise Engineering work. Captures details of a working component of the enterprise. System includes, for example, application, system, platform, system -of-systems, enterprise and product line. Captures the definition of the Architecture work. Captures the actors interested and involved in the enterprise. Captures the architectural descriptions and identifies the system’s stakeholders and their concerns. Captures the statement of purpose for the Architectural Description. A Pattern for constructing Views – Viewpoints define the rules on Views. Each View corresponds to exactly one Viewpoint. A representation of a whole system from the perspective of a set of Concerns. 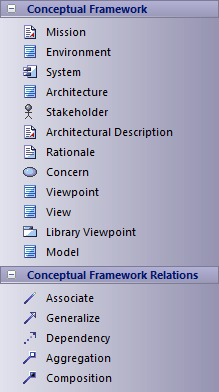 A View can contain one or more architectural models, so the View can use multiple notations. Captures a collection of categorized Viewpoints. Defines and represents a model.